Anna Cosgrove slipped into the shadows of an alcove at the Westin Book Cadillac Hotel and peeked around the burgundy gossamer curtains for a closer look. Her heart threatened to burst out of her chest as she ogled the man standing a mere eight feet away, engrossed in a conversation with two others. Although the buzz of the crowded ballroom drowned out their words, she could still hear his hearty laugh. The sensuous sound resonated deep within her, sending delicious little chills racing down her spine. She closed her eyes and savored the moment; it had been too many years since she last heard the rich timbre of his voice. Anna chuckled and flipped open her fan, waving it to cool her flaming neck and cheeks. If Ellen only knew the fantasies she’d conjured up in the moments before her arrival. There was something about a man with a slightly crooked nose that lent him a distinguished – or perhaps mysterious quality – like he wasn’t above getting dirty if need be. And that plump lower lip of his, a touch thicker and fuller than his top lip, screamed to be sucked into her mouth. Or was it his piercing blue eyes? So translucent and bright it was like a gateway to his soul. of kissing that mouth? A thousand? Ellen was right. Anna has been overwhelmed by his bigger than life personality and popularity but that didn’t mean she hadn’t secretly lusted after him. She sighed and smiled back at him. Warm lips brushed against her cheek within an inch of her mouth, causing a riot of tingling sensations to explode in her stomach and radiate throughout her body. His familiar musky cologne washed over her and bathed her in the memories of their twelve weeks together: the contours of his muscular body as it pressed against hers, the hooded eyes blazing a sensuous trail to her most private parts, husky words followed by an even huskier laugh. Surely he must see the desire flashing in her green eyes as they raked over him, taking in the fine figure he cut in his black tuxedo. What she wouldn’t give for another chance to dance in his embrace. No doubt he still rocked a six pack under his finery. A sharp elbow to her side ripped her back into reality. Seconds ticked by in silence as they gazed upon one another. Brett lifted his chin in acknowledgement when she wandered away, never once breaking eye contact with Anna. As soon as they were alone, he took a tentative step closer. The space between them charged and nearly vibrated in its intensity. She stepped back further into the alcove, only to find her back suddenly up against the wall. A lazy smile crept over his face as he advanced on her and she braced herself for the onslaught of emotions that were sure to come. “If the look on Ellen’s face is any indication, you’ve still got the touch,” she said, falling easily into the flirty banter from their college days. The man hadn’t lost his touch one bit. She licked her lips and marveled at the myriad sensations coursing through her. Lord help her. If they were alone, she might already be ripping open his shirt. Was she single? Right at this moment she was single, and she would be until about this time two weeks from now when she announced her engagement to her best male friend, Jorge. But he was gay. And it was a marriage of convenience. So that didn’t count until it was official, right? She bit her lip, recollecting every one of his moves. Such sweet torture he had put her through! Probably along with a host of other females. She dragged in a rough breath and her gaze lingered on his sinfully full lips for a moment, imagining how they’d feel pressed against hers. Not soft and feathery, rather hard and possessive. Out-of-control. A finger crooked under her chin, lifting her eyes to meet his bold stare. The intensity of it set her body on fire, igniting a burning ache between her thighs. Could his words be true? Had she made him out to be a rogue because of her own insecurities and fears that she might not be enough for him? A well of emotions bubbled up in her and she longed for the chance to rekindle their friendship. Why hadn’t he shown up in her life six months ago? The orchestra music suddenly trailed off on a single, elongated note and she closed her eyes, taking a deep, calming breath. He pulled out his dance card and scanned it. A deep furrow settled between his brows when he came to the same frustrating realization that she had; Anna Karenina was not on his list. She cupped his face in her hands and searched his eyes. How she wished tonight would be a night to remember with him before she committed herself to Jorge. Jorge would be the first to tell her to go for it. Just once she wanted to feel Brett’s lips on hers. She slid her fingers through his luxuriously thick blond hair and pulled his mouth down to hers. His lips were soft as velvet. Once … twice … she raked her mouth over his and on the third time her tongue slipped between his lips. His hand grasped hold of her neck, pulling her closer to deepen the kiss, while his tongue boldly explored her mouth. Within seconds the kiss exploded, taking on a sense of urgency, as if they both knew it was now or never. “Ladies and gentlemen,” the commentator announced, his booming welcome echoing throughout the ballroom. Anna pulled back, gasping for air. How had she ever resisted him? Surely the man could make a sinner out of a saint. 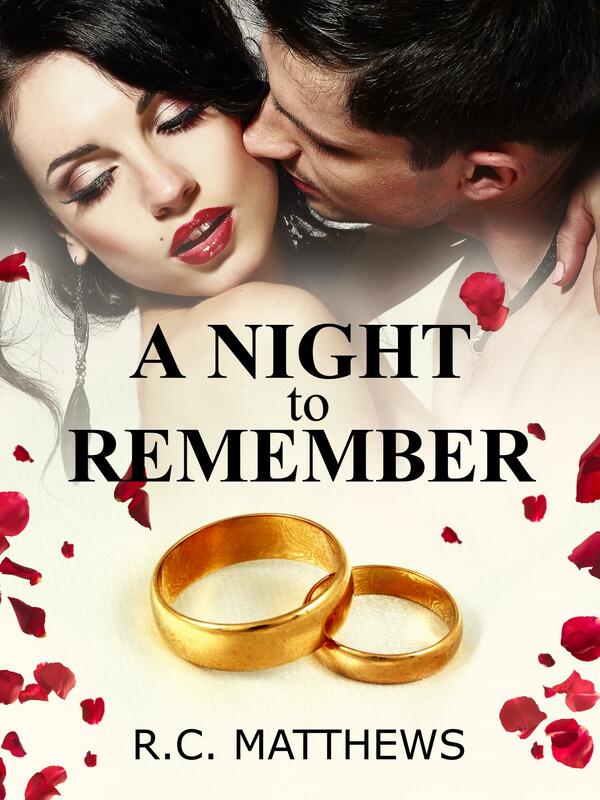 She held her fingers briefly against her ravished lips and soaked up the remnants of desire glowing in Brett’s eyes before she trailed her finger along his square jawline, committing it to memory. “You’re still smoking hot,” she said with a wide grin and then turned to rush towards the stage.